6 pm – Grandson George and his girlfriend Daisy here for dinner and match. Daisy not any knowledge of game. Liverpool FC education given; she saw match build-up, now a fan. 7.45 pm – Game on. Daisy in Klopp scarf. 9.45 pm – Game over. All happy and ready for second leg. 10.15 pm – First lady and I retire to bed (rear of building), all aglow with goals from Mo. 3.45 am – Disturbed by noise, went to front window and witnessed ram raid; all electric off. So, with torch and mobile, phoned police and fire service. Now the fire started by the raiders was 15-feet high. A big concern as two cars close by could catch fire and do extensive damage to buildings. The emergency service response was 11 minutes – fantastic. Thanks to all who saved the buildings. During this time Douglas arrives, saw the fire and diesel and fuel running down the road on fire. He checked we were safe; he was upset and angry. Dawn – We went to view the damage and saw how extensive it was. Douglas at the shop from 4 am till late in the evening as the electric was part-restored for the post office – and mum and dad. Post office counter open as normal. 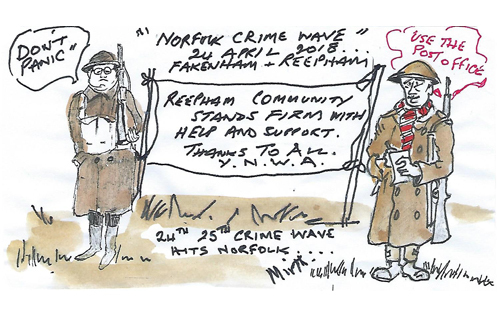 Reepham responds; people shocked by the event. Great support for us all, family and staff. We had great outpourings of sympathy from the public with cards, flowers, phone calls, tea, cakes, coffee. It was very touching. We thank you all. We saw what Reepham can do at times like this. 3 pm – All electric on, now the clean-up and services resumed. The future: rebuild, new plans, improvements.